Our umbrella can shelter you from rain,blocking wind and resist UV rays. Automatically Open/Close-Simply press the button on the handle to open, press it again, the canopy will be retracted,very convenient. 3-STRONG FEATURES-Wind resistant frame system with 10 ribs; Superior Waterproof Fabric. , the frame simply bounces back safely to its normal shape. DUAL USE-Our umbrellas are Waterproof and Anti-uv. LIFETIME REPLACEMENT GUARANTEE-If you are not satisfied with your umbrella, just return it, we will replace it or refund your total purchase with no additional cost. You are protected for life from the rain, sleet and snow, through our lifetime replacement guarantee program. If you have any question,please feel free to contact us,we will try our best to help you. Qaulity Materials: Our compact umbrellas are crafted with 60 MPH windproof, 300T Waterproof fabric anti-UV umbrella canopy and 10 ribs high quality design. Super fast Auto Open and Close:Umbrellas of punming are super easy and convenient one-handed operation. Quickly open and collapse the canopy with the push of a button. 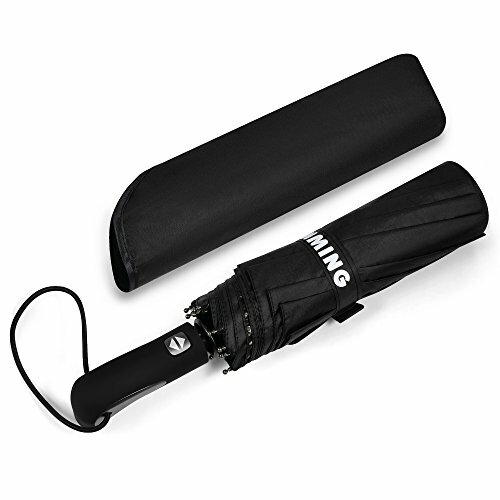 You do not have to struggle with the opening your umbrella.Folding of the canopy is only a push of a button away as well. Windproof Design:10 reinforced ribs with sturdy all metal frame and shaft make the canopy highly wind resistant for storms and the harsh outdoors. Compact, lightweight, stylish and durable for the best quality weather protection. Portable and Lightweight:The 300T specially coated water repellent fabric and slip resistant rubberized handle make it outperform other compact umbrellas. Foldable to 13 inches, it is small enough to slip in a coat pocket, tote or bag. Replacement Guarantee:If you are not satisfied with your umbrella, return it within 20 days, we will replace it or refund your total purchase with no additional cost.Professional After-Service team provides necessary support to you for any inquires during your usage. If you have any questions about this product by Punming, contact us by completing and submitting the form below. If you are looking for a specif part number, please include it with your message.